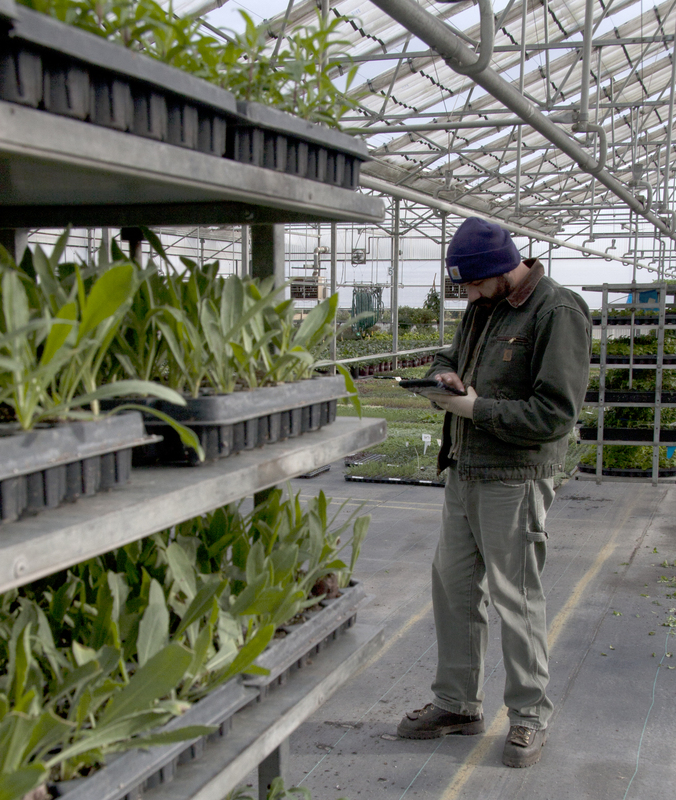 Remigio Echeverria Bucio, division grower at Blooming Nursery, tracks plants on an iPad using customized inventory management software. Division leaders are responsible for keeping the ready dates, quantities and quality of each crop in their area accurate in the system at all times. The new year is an opportune time to look back and see how sales fared. What plant was the best seller? How many plants had to be dumped due to overproduction? Who was the highest-selling salesperson? Which customer bought the most containers of a certain plant variety? Based on these numbers, what kinds of forecasts can be made for next year, or even several years down the road? The ability to provide accurate answers to these questions starts with the all-important process of inventory management. Inventory management (IM) includes counting plants and using computer programs that keep track of that information so it can be given to salespeople and production people. 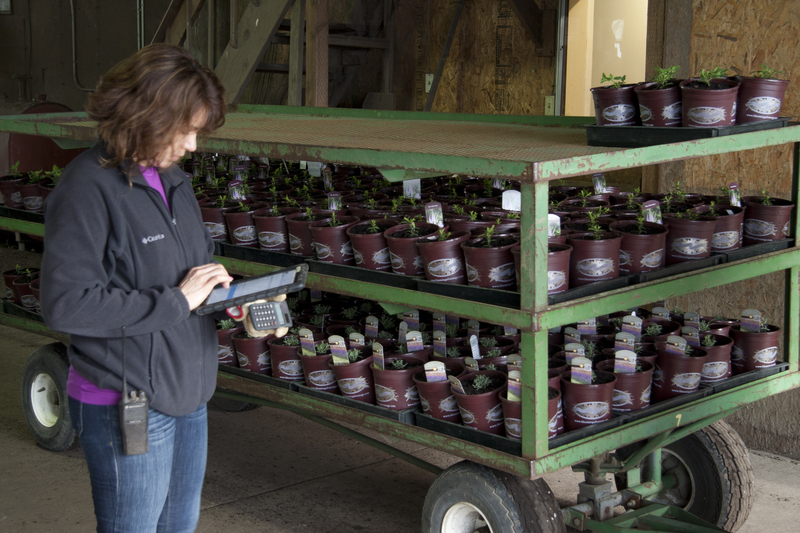 Managing inventory is one of the most critical tasks facing nursery and greenhouse managers. In order to maintain control of plant materials, an IM system is needed. By maintaining a current, up-to-date plant material inventory, problems arising from overselling or leaving plants unsold can be minimized. J. Frank Schmidt, for instance, employs three full-time people in the inventory department. They are supported by another dozen out in the field at various times of the year, doing counts and reporting back that information. Rodger Duer, site inventory manager at Monrovia, stressed the importance of cycle counts — the auditing procedure whereby a small subset of inventory, in a specific location, is counted on a specified day. Duer said he orders cycle counts based on activity. The ideal IM system should be able to accurately indicate — at all times — how many plants of each variety or cultivar are available, in what size, and where are they located within the greenhouse operation. “Going back five or 10 years, things were sketchy as far as accuracy was concerned,” Duer said, noting that Monrovia addressed those issues when it switched to its current software system in 2009. Availability lists are posted online so that Monrovia sales representatives and customers can access them anytime; also, most growing areas have a dedicated employee whose job is to take plant photos with a cellphone. “A custom program automatically uploads the images to the servers and becomes immediately available, along with comments on the plant’s condition — whether it’s in bud or bloom, or showing fall color,” Duer explained. Monrovia grows and ships millions of plants, necessitating a technically advanced IM system. By comparison, many small to medium-sized growers manage inventory simply by using QuickBooks and Excel. In addition to a grower’s size, experience can also play a big part in how inventory is managed. Vinny Grasso, sales manager for the past 18 years at A&R Spada Farms in St. Paul, Oregon, keeps it as simple as possible. Grasso uses a customized software system, SpadaTech, which automatically adjusts inventory and updates the availability list as product is sold. The list is updated daily on www.spadafarms.com, and also accessible via a link on the company’s online Nursery Guide webpage. Complexity is the bane — and boon — for Grace Dinsdale, owner of Blooming Nursery in Cornelius, Oregon, a wholesale grower of more than 2,200 varieties of perennials, flowering shrubs, herbs, ground covers and ornamental grasses. Dinsdale also owns and operates a nearby retail business, Blooming Junction. Depending on the time of year, Dinsdale may be tracking up to 10,000 different plants in various stages of production and saleability. Just-potted plants are logged into Blooming Nursery’s inventory management system by Maria de la Luz Godinez, transplanting foreperson. All inventory is entered into the system on the same day it is created directly by the person in charge of the work. Photo by Peter Szymczak. Managing nursery inventory is “like shifting sand. It’s nearly impossible to control, but we supply simple and easy-to-use tools to manage it,” said Ben Marchi-Young, sales and marketing manager at SBI Software, the tech firm based in Portland, Oregon, that custom-built the inventory management system used at Blooming Nursery. Other local tech companies such as PlantX and ACS Software also develop IM systems to fit the needs for most any sized operation. 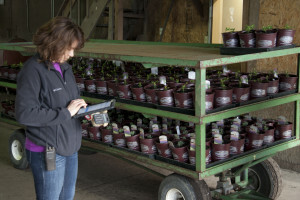 Mobile devices give growers out in the field the ability to make adjustments and track movement of their material, so that staff in the back office can be made aware of changes in inventory immediately. Work orders to begin picking plants can be issued directly from the field and sent to shippers at the dock locations. Tablets or smartphones can then scan out the product as it leaves inventory. “With better internal visibility comes more accurate availability lists, allowing you to focus on what is or going to be available to sell,” Marchi-Young said. More than half of Gold Hill’s employees use smartphones every day for their tasks: counting plants, tracking the location of plant material, and shipping transactions are all documented as they are happening via a farm-wide Wi-Fi network.